THE PERFECT GETAWAY FOR A FAMILY OR LARGE GROUP HGTV HOME REMODEL YOU WILL LOVE! Stunning luxury home located in one of Scottsdale’s best golfing areas. Recently remodeled, this 3,795 sq ft beauty has 6 bedrooms 3.5 baths that sleeps up to 20 people. This home is truly perfect for that golfing oasis you and your friends always wanted to take, families wanting to check out Westworld, the premier, nationally recognized event space with events all year round or for a weekend of shopping and leisure. ***** DISCOUNTED GOLF PACKAGE **** Once you book your trip, I’ll provide you a direct link to my golfing digest for FREE, which will provide you roughly 15 – 30% off of the rack rate on most of the public golf courses in Arizona. Plus you will be able to reserve your tee times all with one phone call. By using this one feature, all depending on the number in your party who want to play golf, this could literally save you hundreds to thousands of Dollars during your stay. Need a break? This home offers everything you need for the perfect week or weekend. If you love to cook this is the home for you. This home is equipped with a beautiful kitchen will please any caliber chef. Amenities include a brand new 6 burning gas range, a fridge big enough for two homes , two dishwashers and granite countertops with breakfast bar to enjoy that freshly squeezed orange juice. Want to host, but don’t want to cook? Ask us about setting up catering and have your very own private chef. This home has 6 bedrooms with several queen size sofa sleepers. The master bedroom has a king size bed, with an impressive master bath suite, with a muti-head shower system for a truly luxurious experience! To ensure the comfort of all, in addition to the King size bed, there are three queen beds four double beds, and a full size bed (with en-suite bathrooms and walk-in closets in three of the bedrooms. A total of 3 ½ baths ensures that everyone has ample space. The entertainment continues outside where you can relax or take a dip in the beautiful pool. The back patio is great for outdoor dinners (roasting marshmallows over our firepit) and to share good vibes. The home is surrounded by gorgeous landscaping and beautiful views of the mountains. This is the perfect spot to enjoy the amazing sunsets that Arizona has to offer. This is truly a golfer’s paradise! Some of the best golfing in Arizona is right around the corner. Sign up for tee times at top-rated courses like TPC Scottsdale, Grayhawk Golf Club, Westin Kierland Golf Club, and Troon North. 3 mins away is the annual Waste Management Open where you can watch your favorite pros in action (our calendar fills up quickly for that weekend). Other great amenities are conveniently located within a short distance. Right around the corner are Impressive walking/hiking/jogging trails waiting for you to enjoy the beauty of Scottsdale. 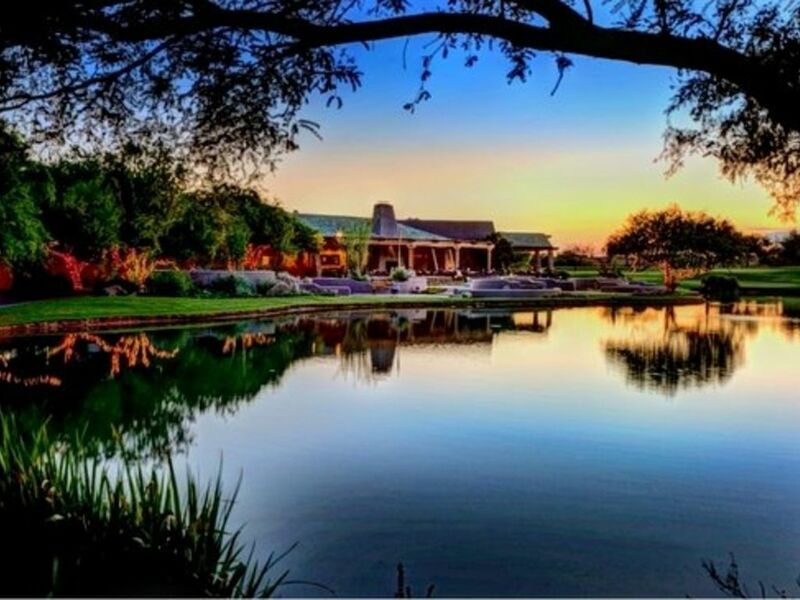 Close by is the quaint town of Cave Creek with all of the rustic cowboy flair it has to offer. Saguaro and Bartlett Lake are just a 30 to 40 minute drive away for those that love swimming and boating. There is easy access to the 101 Loop to whisk you around to anywhere in Phoenix and is only 10 minutes from Scottsdale’s private jet airport and 20 minutes to Sky Harbor Intl Airport. Welcome home and enjoy your stay at this truly amazing vacation paradise! Recreation room with PS4 to enjoy Netflix, Hulu,and blue-ray capabilities. Heated pool coming soon! Please review all information in my house rules and understand that by booking this property you agree to all policies in that document. Please keep in mind that groups above 6 people will be charged an additional $25 person/per night automatically to their booking. I absolutely love Scottsdale and am a travel enthusiast and entrepreneur. I have years of experience in the hospitality industry and will do everything I can to make your trip a memorable experience. You are trying to find the nicest place at the best rate possible ,and I know the Scottsdale area from living in the area for several years and know my home is such a good value for you, your family or group! Feel free to contact me with any questions! I look for only quality properties in great neighborhoods that will provide guests with a first class vacation experience. You are in the perfect location for taking advantage of all Scottsdale has to offer. With quick access to local grocery stores, the nearest Starbucks, gas stations, restaurants, golf courses, and hiking trails. This is the perfect house for rest, relaxation, and spreading out. No matter if your a small party of 5 or a larger group of 16, this house has been priced at the best possible rates. So come see for yourself and stay at my property to experience all the amenities you see in the newly remodeled pics. It's truly like living at a 5 star resort at a fraction of the cost. The property comes as advertised as seen in the pics. The house sits in a quiet and safe golf community. The home is beautiful and very clean and it shows that the owner takes pride in the care of it. I would stay here again and would recommend to anyone looking for accommodations for your stay in Scottsdale. We had a great time in your home. The perfect location and a great home to get away and relax. Great backyard for enjoying the AZ weather. Home was very clean and well stocked with extras. John was extremely helpful with our stay. The house was great for our large group and was perfect for what we needed. This house was amazing!! I only wish it was a bit warmer at night so we could have enjoyed the pool more. Our host was very accommodating leading up to our stay and had everything ready when we arrived. I would highly recommend this house for those looking to get away and spend some quality time in the Scottsdale area. Thank you for your awesome feedback! I wish I could have made the weather warmer for you too haha. Again, thank you for choosing to stay at my home and please do come back anytime! Beautiful home, accommodated 10 guys for a week of golf and Barrett Jackson car auction. Very disappointing that there were plumbing issues, very slippery shower floors, and the dishwasher was broken. Especially since we cooked breakfast every day and dinner a few nights. Thank you again for choosing to stay at my home. I'm glad to hear you had plenty of room during your stay. It is disappointing to hear about some of the issues you had during your stay and can only imagine how that could have been frustrating. I would have happily resolved any issues I could have. I was on call 24/7 during your stay and can be reached through my personal cell provided at the home. I'll make sure those issues are taken care of for future guests. Your more then welcome anytime again in the future! Allison R.Where do you live? Great place to stay for our family in town for a wedding. Lots of bedrooms and bathrooms for all. Handy to freeway, groceries and shopping. Large comfy gathering spaces to enjoy our short time together. Many thanks to our friendly and responsive host. Thank you so much for taking to time to share your experience! I work tremendously hard to make sure guests have the best possible experience. So glad to hear you enjoyed your time while staying at my home. Please do visit again in the future!